(1) Model CSC-50A Automatic Cartoning Machine (box folding→filling→packing) is specially design to automatic pack small quantities’ multi size box. (2) With low cost and only require small area. It is suitable for various sizes of box. 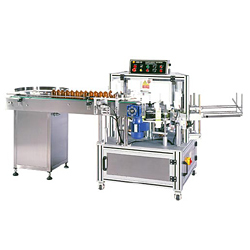 The machine is a vertical type with mutiple function and require a shorttime to change mould. (3) The machine is made of aluminum alloy with anode treatment. Rust proof long service life and easily clean.Product automatic drop into box via star wheel and conveyor. 2. Suitable usage: round bottled medicine, foodstuff, cosmetic, etc. packing into square box. 1. Paper box’s smallest size: 60 x 20 x 20 m/m. 2. Paper box’s largest size: 200 x 80 x 80m/m. 3. Production speed: 20-60 box per min. 4. Power supply: 220V; 0/60HZ, single phase. 6. Compress air consumption: 235L/min. 7. Machine measurement: L2375 x 1330 x 1250m/m.